Our website support technician Perth is exactly what you need for any troubleshooting concerns. All you have to do is supply us with all the important details related to the task or problem you want to be completed or fixed. After that, you can relax – your concerns are now being taken care of! Just like any other precious thing of yours, your site also needs tender and loving care. If your car needs regular maintenance, your business site also needs a regular check-up. Bugs and failure on your site could be the culprit of your business unproductivity. Problems like unwanted spams, messages, plugin errors, code breaking, etc. may be the possible causes of such web malfunction. If there is no correction made, these problems may cause your system to crash, which will result in greater damage and further inconvenience. The worst case scenario would be when your site totally goes down! When that happens, you will not be able to achieve your business goals. Take note! Your web is your sales floor. It serves as your showcase room to attract customers. Thus, maintaining its functionality is a must. There are many possible reasons why your site could be acting unusual. Diagnosing it yourself is possible but efficacy is not guaranteed as it is very time-consuming. It’s better to call a professional who can assess your situation and give long-term solutions to your problems. We are a team of web support technicians who are licensed and certified to handle any problems that could be causing your site to slow down. Solving website crashes and the outage is our frontline masterpiece in which we take pride in giving solutions to in the shortest time possible. We can assure you that our experts always walk their talk. They never cease to learn the latest trends in IT matters. Each one of them is knowledgeable to attend to your problems and provide technical assistance and support which is are efficient and time-bounded. They can give you troubleshooting and web support through the use of the latest technology. They can also review your site and even talk to you to answer your technical questions. Our services come with proper documentation just to meet your needs. Our website support technician Perth has enough interpersonal skills in working with a website support manager in order to develop comprehensive solutions. All of these are to give you the quickest and the most effective solutions to your web concerns! 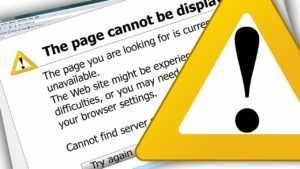 Do not wait for your site to sink into a deep outage. We, at Aleph IT, can help you boost your productivity by providing solutions to your web problems! We guarantee to give you a team of licensed website support technician Perth that can handle any web bugs and faults. Call us and get only the best! This entry was posted in Aleph IT Services and tagged web support, website errors, website support, website technician.